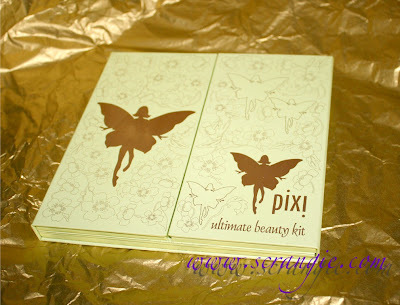 One more item from Pixi for Holiday 2011. The last one was a fantastic set of three mini eyeliners, this time we have a very large blockbuster-style palette with items for eyes, cheeks and lips. It's called the Pixi Ultimate Beauty Wardrobe. As you can see, it's quite a formidable palette. 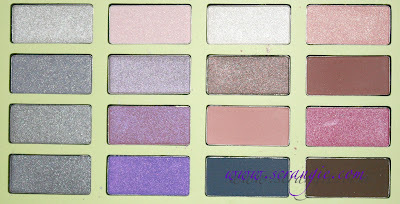 The left and right covers of the palette contain eyeshadows; sixteen shades on each side. 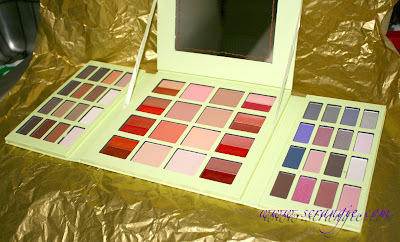 The center of the palette contains sixteen lip colors and eight blushes and the lid on that section has a full size mirror underneath. The left flap contains a selection of neutral eyeshadows. There are shimmers and mattes, light shades and dark shades. Swatched over bare skin, no primer. The colors don't have names, but the swatches start with the lower left corner and continue up the columns vertically, ending with the upper right hand corner shade. The right flap has some more colorful options like violet, teal and mauve. There's also a variety of finishes ranging from frosty to matte, just like the neutral half. Swatched on bare skin, no primer. Swatches start with the lower left corner shade and go up the columns vertically. 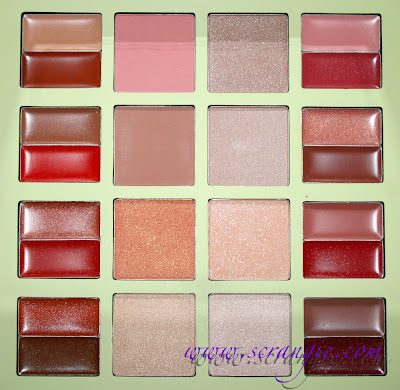 The center portion of the palette contains some lip colors, blushes and highlighters in both matte and shimmer shades. These are the blushes and highlighters swatched on bare skin, starting from the top left shade and ending at the bottom right shade. Big variety of colors and products. Shadows range from greys, browns and taupes to violets and pinks. Blushes are both warm and cool, shimmer and matte and include highlighting shades. I actually like all of the blushes and highlighters. They're my favorite thing in the palette. They're powdery, but blend well. Contains a full-size mirror that's good for travel. The quality of the product isn't that good. The shadows are split between hard and chalky or flaky and powdery. There's a few really nice ones, but overall they're not true to color, have poor pigmentation and feel very talc-y/chalky. The shadows do not apply true to pan color. The lip colors are sticky and strange feeling. The lip colors don't have enough variety and some of the colors are downright unflattering. 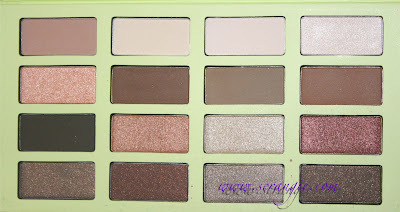 This palette takes up a huge amount of space and is very difficult to use while it's open. It's too expensive for the quality of the products inside; this palette is $40. I'm really not very taken with this palette. I am a huge fan of palettes that have a wide variety of shades all in one place, but the quality of the shadows isn't up to snuff. This would probably be a good gift for someone who's not super into makeup and doesn't have a big collection, like young teen girl. There are a bunch of useable shades and the blushes are quite nice, so someone who isn't as picky as a makeup junkie would probably really enjoy this. If you are more of a novice or advanced makeup collector/user and you have a lot of experience with different brands already, you might be unimpressed with the chalky shadows and sticky, sheer lip colors. For $40, I think you can do better. You may not be able to get as much of a variety of different products, but the quality will be better. For example, these Profusion palettes that are available at drugstores during Christmas are very poorly constructed and cheaply made, but the pigmentation, payoff and blendability of the shadows themselves is excellent and the variety of colors is much nicer. Or, there's always those dirt cheap 88 palettes that contain very small shadows but have pretty good quality on most of the shades and a good variety of colors. In my opinion, this palette isn't horrible, it's definitely useable and I don't hate it, but you really can get better made in China eyeshadows, blushes and glosses for less money elsewhere. If this palette was half the price, I'd say go for it, but at $40 I have serious reservations about it. The Pixi Ultimate Beauty Wardrobe is available at Target, where it's currently on sale for $34, or on PixiBeauty.com for $40. Too bad this wasn't really worth it. I like the concept of these big kits in theory, but I haven't really seen many that make me want them. Thanks for reviewing this for us! Looks pretty but glad you reviewed it. I was tempted but I will give this a miss. I'd like to find a site, where I could buy it online and if they can send to Italy! I want it! !